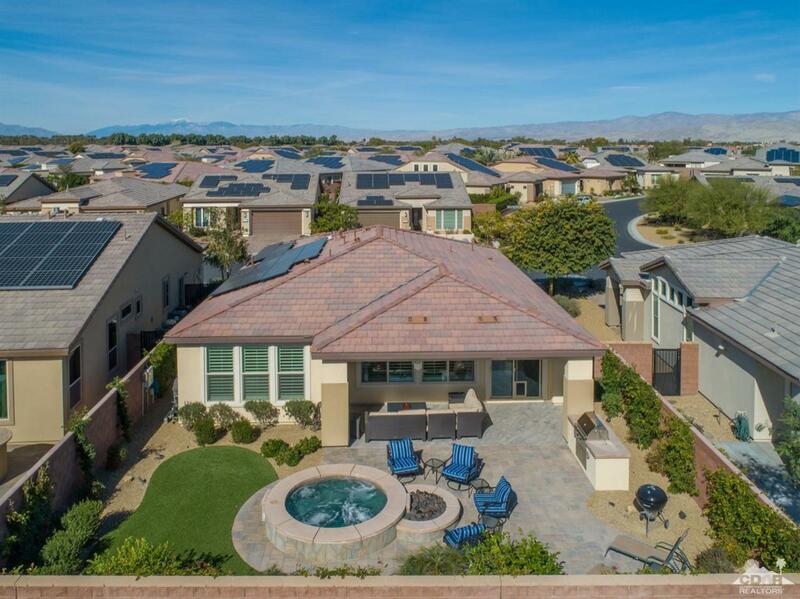 This Southeast Facing SOLAR Powered St. Tropez Model Encompasses Desert Living at its BEST! Exceptional outdoor living amenities include generous spa, fire pit, built-in BBQ, custom tiled covered patio and low maintenance desert landscape with artificial turf. This well configured floor plan offers nice bedroom separation between master suite and guest bedroom. Highly upgraded appointments include soft close doors/drawers, sophisticated tile and stone accents, plantation shutters throughout and upgraded moldings, to name a few. This home offers a unique opportunity to own a solar home with incredible mountain views and close proximity to the clubhouse. Trilogy Polo Resale Homes Offer Significant Savings on Club Membership. HOA + Club Dues of $330 include fitness facility with multiple class offerings, active social calendar of events and clubs, 3 pools, tennis courts, pickle ball courts, bocce ball, community parks, common area maintenance and guarded security. Buyer to Verify.